The Edgar Allan Poe pendant my friend Rachel gave me for my birthday. It features what's known as the Brady Portrait. 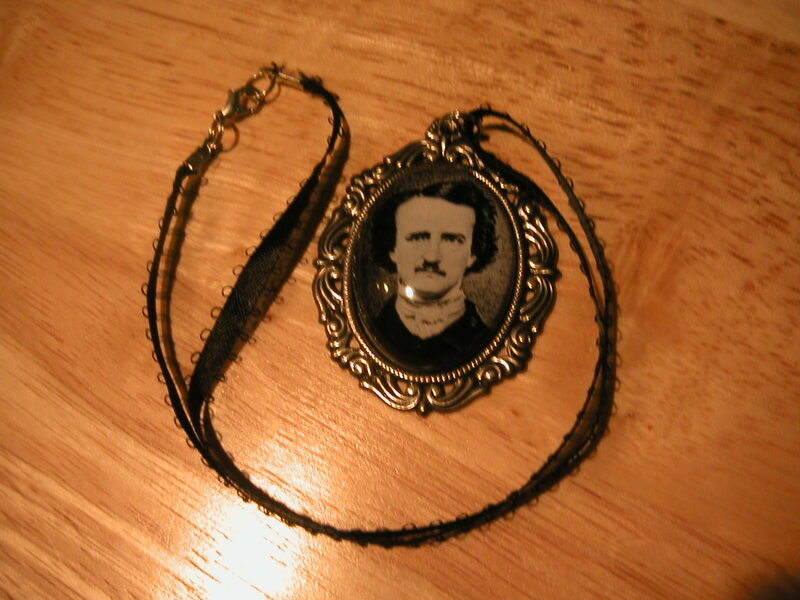 Inside the bag was an oval pendant containing a miniature version of the Brady Portrait of Edgar Allan Poe. Interesting comment. Poe certainly had his share of romantic heartbreak—his beloved, young wife Virginia died of tuberculosis (we need only to read his two-line lament “Deep in Earth” to understand just how inconsolable he was). But most people forget that Poe had quite a failed love life both before and after his wife. He returned from the University of Virginia to find his childhood sweetheart engaged to someone else; he shared an “intensely emotional friendship” with “Fanny” Osgood, but she went off with Poe’s rival; both Marie Louise and Helen Whitman, briefly Poe’s muses, turned down his marriage proposals; he fell in love with Annie Richmond, who was married and unattainable. And there were a few more. I admired the pendant. No matter which way I shifted my palm, Poe was looking at me—in fact, he was never going to not be gazing at me. He couldn’t look away from me any more than he could’ve looked away from his loves long after they were gone. After all, Poe’s horror stories didn’t necessarily deal with haunted houses or objects, but with haunted people. People who couldn’t escape their pasts or their broken or unrequited loves. “Ligeia,” “Berenice,” “The Fall of the House of Usher,” “Morella,” and “Eleonora” in particular feature men who are haunted by their lost lovers. In the scarcely-mentioned “The Oval Portrait,” it’s a woman whose love isn’t returned. Poe wasn’t the only writer who did this. There are, perhaps, hundreds of ghost stories by others out there that deal with those haunted by lost or broken love—one of my favorites is David Huddle’s “The Day Ghost”; another is Kipling’s “The Phantom Rickshaw.” And it’s interesting to note that Sting’s song “Ghost Story,” which appears on his Brand New Day album, has nothing to do with the paranormal—it’s a lament for a broken romantic relationship. In short, when a love-bond breaks, probably the last place we’d think to seek comfort is in a ghost story. But it’s worth considering. Ghost stories can be reminders that we aren’t alone in our intense suffering—and that if we don’t let go, we may be doomed. A friend sent me a video of empty chairs on his back porch in the rain. He told me he’d left them sitting there in the same position for nearly a year—even through the winter—because it had been a favorite hang-out of his and someone who’d left his life, and he missed her, so he couldn’t bear to move them. Sounds like the makings of a good ghost story. “Deep in earth my love is lying/And I must weep alone.” According to a note in Poems & Tales of Edgar Allan Poe at Fordham: “‘Deep in Earth’ was presumably written after Virginia Poe’s funeral in February, 1847. It was found in the manuscript of “Eulalie,” a poem about a happy marriage. (See Mabbott).” Elizabeth Beirne, ed., Poems & Tales of Edgar Allan Poe at Fordham (New York: The Bronx County Historical Society, 1999), 3. Jeffrey Meyers, Edgar Allan Poe: His Life and Legacy (New York: Rowman & Littleman Publishing Group-Cooper Square Press, 2000), 29. A short summary of the plot of “The Phantom Rickshaw” can be found here: http://www.kipling.org.uk/rg_phantom1.htm. The full text is available here: http://www2.hn.psu.edu/faculty/jmanis/kipling/Phantom-rickshaw.pdf. Posted on May 18, 2010, in Deep Thoughts & Fun Stuff and tagged Broken Relationships, Edgar Allan Poe, Ghost Story, Lost Loves, Poe, Rachel Kovaciny. Bookmark the permalink. 4 Comments. Thanks, Gail! I’ll give you a call later to see how your jewelry night went! I’m glad you like it so well! And you’re right, Poe’s stories are much more about haunted people than haunted stuff — probably why they’ve endured. We’re all a bit haunted in one way or another. Rachel, that was seriously the coolest gift! And look what it inspired! You rock! And yes, we are all haunted by stuff. I know that’s what appeals to me about ghost stories.